Catherine Deane is a Research Specialist at Shearman & Sterling LLP in San Francisco, California. 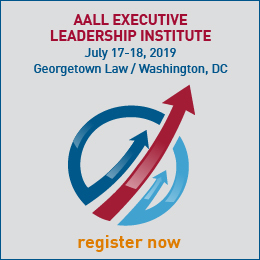 I joined AALL to find a job. At the time, I was a student and my parents paid for the membership and the conference trip, so I needed to leverage my conference attendance into a full-time permanent job, pronto. The answer to this question changes all the time. Initially I stayed a member, because, I was enthusiastic. I devoted a lot of energy to participating fully in the FCIL-SIS which was full of law librarians who had my dream job. Today I stay a member to be of service. I’m the Chair of the FCIL-SIS and I’m here to do my duty by keeping the FCIL-SIS chugging along and maybe even making some minor improvements to the way we do things. I’m here to be the change I want to see. I think we can do better when it comes to diversity and inclusion and I want to be part of that movement. I brought up the issue of microaggressions in law libraries, in my February 26, 2015 post on the now defunct AALL Spectrum Blog, because analyzing the profession through the intersectional lens of racism and sexism allows us to identify problems and make improvements. I’m here to participate in a conversation about how we can make this profession work for all of us, not just the most privileged of us. 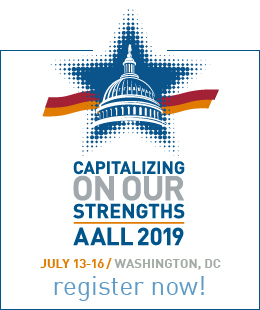 The most valuable benefit is access to other AALL members. I have learned so much from talking informally to other law librarians and vendor representatives. I was able to transition to the law firm environment in part because I spent years grilling law firm librarians about their jobs. I might not have had the courage to make the switch otherwise. It’s impossible to stay up to date on every aspect of law librarianship, but I enjoy learning about whatever people are passionate about. I’m interested in how law librarians think and why they think that way. This helps me to understand what people’s fears are for the future of the profession and where the profession is going. Right now, I think more people are interested in moving from academia and government jobs to the law firm environment because academic salaries are not keeping up with the cost of living. I’ve been sharing with the, predominantly academic, FCIL community what it’s like to be in the law firm. Every year I look forward to the FCIL Schaffer Grant recipient’s Presentation. It’s interesting to understand some aspect of what it’s like to be a law librarian in another country. This is always followed by the International Attendees joint reception, which is a great event for meeting FCIL librarians, law librarians from other countries and hearing about the upcoming conference of the International Association of Law Libraries. The other event that I love is the Diversity Symposium. This lets us know where we are in the profession in terms of what our most politically disenfranchised members need and want. 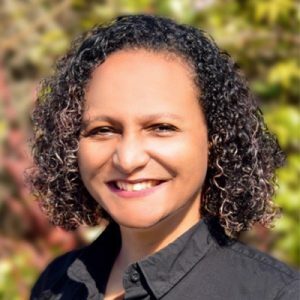 This is a rare chance to listen to diverse law librarians share their experiences about the unique issues of being a minority in our profession. During the post-Symposium reception, you can look them in the eye and have a deep conversation about how to effectuate change. History will judge our profession for how we treat our most vulnerable members, attending this session so you can learn how to accommodate those less privileged should be everyone’s priority, especially policy makers. I spend most of my free time, creating community, singing and playing the Venezuelan cuatro, dancing and taking aerial classes to stay strong and fit like the notorious RBG. Ever since I found that the SF Public Library has 3 apps that I can use to borrow books, I’ve been reading two or three books at a time. I often read books that I think will inspire spiritual growth, like Brene Brown’s The Power of Vulnerability or Amanda Palmer’s The Art of Asking (these are Ted talks that are also books). I also like autobiographies, so I’m currently reading Michelle Obama’s Becoming. Trinidad and Tobago. This is my home country so it contains my parents and my youngest brother, which makes me somewhat biased. But I love Trinidad for the people who are beautiful inside and out, and for the gorgeous warm weather, the lush vegetation and the delicious food. I am lucky to have spent my childhood there and I’m always excited to go back for a visit. Put it on your bucket list now. You should especially consider going for Carnival, it’s indescribable.